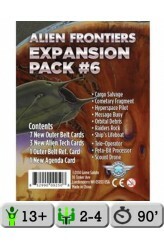 Contents 4 Alien Tech Cards (for use with Alien Frontiers) Graviton Shunt Infiltration A.I. Infinity Mirror Magnetic Lockdown 3 Faction Reference Cards Corex Conflomerated Dark Space Explorers Homesteader's Union 2 Agenda Cards (for use with Alien Frontiers: Factions) 2 Blank Alien Tech Card 1 Blank Agenda Card .. 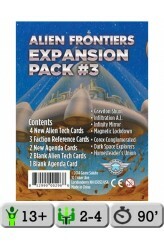 Contents 4 Alien Tech Cards (for use with Alien Frontiers) Nano-Recycler Null-Time Vault Probability Focus Resonating Beacon 3 Faction Reference Cards New Gaia Engineers Proxima Centauri Sch. 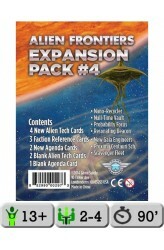 Scavenger Fleet 2 Agenda Cards (for use with Alien Frontiers: Factions) 2 Blank Alien Tech Card 1 Blank Agenda Card https://www.youtube.com/watch?v=BsTO15b6iwI .. Contents 7 Salvage Cards (for use with Alien Frontiers: Outer Belt) Cargo Salvage Cometary Fragment Hyperspace Pilot Message Buoy Orbital Debris Raider's Rock Ship's Lifeboat 3 Alien Tech Cards (for use with Alien Frontiers) Tele-Operator Peta-Bit Processor Scout Drone 1 Outer Belt Reference Card 1 Agenda Cards (for use with Alien Frontiers: Factions) .. 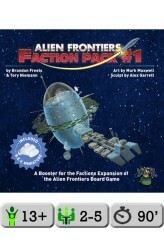 Clever Mojo Games will release a series of expansion boosters that expand the AF: Factions Expansion. Each booster will contain a new Faction board, a pair of new Alien Tech cards, and any extra components that might be needed. So, what's in this very first Expansion Booster? I'm glad you asked! Xeno Explorations, Inc. is the new Faction board -- Xeno has access to a remote exploration vehicle (REV) which they drive across Planet Maxwell, looking for territories to explore and exploit. The REV is a custom plastic vehicle miniature -- it is used to show the territory currently being explored and exploited by Xeno Explorations, Inc. Seismic Detonator is the new Alien Tech card -- a powerful alien weapon that can clear a territory of colonies, but are you mad enough to dare..
Alien Frontiers: Faction Pack #3 - Brethren of the Stars The Brethren are pirate crew known for hijacking ships for nefarious purposes. In their spare time thy have been known to smuggle tridium ore. FACTION ABILITIES OWNER: Use the Brethren Ship to replace any ship on the board and then re-roll an use the hijacked ship. FACILITY: Move the Brethren Ship to an empty dock at the lunar mine and gain 2 ore. 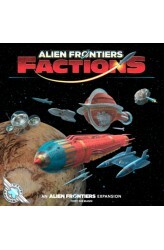 COMPONENTS Faction Board 1 new Alien Tech Card 2 new Agenda Cards Brethren Ship (custom die) https://www.youtube.com/watch?v=LAle9hugqaY ..
Includes everything you need to add a fifth player to Alien Frontiers 8 new Alien Tech cards to expand your technological arsenal 24 Agenda cards that earn you Victory Points for completing hidden objectives 8 individual Faction boards that give their owners an exclusive bonus Another facility that anyone can use... for a price .. 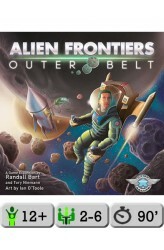 The Outer Belt expansion to Alien Frontiers adds ships and colony tokens for an additional player and expands the playing board. This side-board expands the moon with a new territory, and introduces the nearby Asteroid Belt. Asteroid Counters move through the belt during the game, changing their docking requirements as they change their positions. Staking a claim to an Asteroid will give you resources, a derelict ship, or new alien devices. 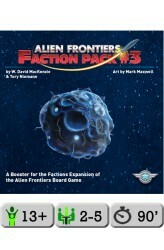 Outer Belt can accommodate 2 to 5 players (up to 6 players when combined with Alien Frontiers: Factions). https://www.youtube.com/watch?v=AAwIx42qEjU ..
As Hitler's grasp on Germany tightens and his maniacal fervor is unmasked, men from the highest levels of the Reich begin to plot his assassination. As the clock ticks and Hitler's ambitions grow, these daring few must build their strength and prepare for the perfect moment to strike. 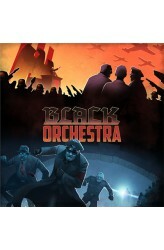 The Gestapo hound their trail, calling these conspirators "Schwarze Kapelle", the Black Orchestra. Will this band of daring patriots save their country from utter ruin before it is too late? Black Orchestra begins with each player choosing an historic figure involved in the conspiracy against Hitler. In this dark and dangerous pursuit, motivation is perhaps your greatest weapon. If you can stay true to your convictions in the face of overwhelming threat and inspire your comrades, t.. The Chamberlain is searching the realm for a new "Craftmaster to the King" and sets a contest for all of the smiths and crafters in the land. The first one to forge four items from a list of the King's favorite weapons and trinkets will be honored as First Among Crafters and Smiths. But watch out, because the other crafters and smiths will try to outdo you at every opportunity. Are you ready to forge your destiny? 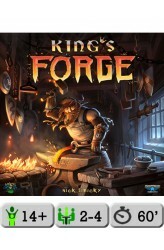 In King's Forge, players are craftsmen and craftswomen seeking to become the favorite of the King. A variety of dice represent the raw materials (metal, wood, gems, and enchantment) and those same dice can be used to gather new dice and purchase roll-modifiers, or saved and rolled in an attempt to meet the requirements to craft the items on the King's list. An early lead i..
Matter swirls around a new born star, coalescing on the planetoids that orbit it. Planets evolve, grow and migrate in their orbits, forming a unique solar system by the end of every game. 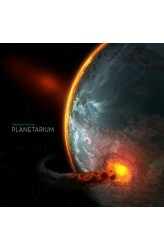 Planetarium is a game of creation, chaos and terraforming on the grandest scale. Players are competing to crash combinations of elements onto planets that then allow them to play cards to evolve the planets in a variety of ways, with each player looking to evolve planets in the system to suit their own secret endgame goals. On a turn a player will firstly move a matter or planet token in a clockwise direction around the star. The board is mapped with a series of lines, tracing orbits around the star, and it is along these lines that the tokens are moved. If a matter token moves onto a space occ..
Haven Town is facing total annihilation at the hands (and teeth) of a horde of monsters from beyond the Shadowrift. You, the heroes, must band together to drive them back. To do this, you will need powerful spells, skills, attacks and loot. When the game begins, you are a basic hero; you can explore and fight. 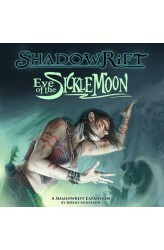 Luckily for you, Shadowrift is a deck-building game! You can buy new cards to add to your deck, cards that will define you as an adventurer and complement the strengths of your fellow heroes. Unlike other deck-builders, there is constant interaction with your fellow players as you figure out who will gain which benefit from the limited supply of townsfolk, offer their coin to help construct walls, and seek healing from anyone who's learned such magic. 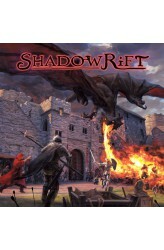 ..
Eve of the Sickle Moon is an expansion to the heroic adventure game Shadowrift, a cooperative deck-building game in which the players are heroes defending a town against a horde of monsters in a high-stakes fantasy siege. This expansion adds two new monster factions: • The Lycanthrope faction consists of were-animals in many shapes and sizes. They all bear the common theme that they're able to bite villagers and spread their curse, and that when the full moon rises they become more powerful. • The Harrowood faction is a forest that has been twisted into a violent hatred of humanity by the opening of the Shadowrifts. They can create Overgrowths, which empower their faction and speed the town's destruction. To fight back against these foes, the..